BANGI, 13 Dec 2012 – Vietnam’s top Non-Governmental Organisation (NGO) for Women’s rights wants to learn more about The National University of Malaysia’s (UKM) research on Women Leadership. Vice-President of the Vietnam Women’s Union (VWU), Nguyen Thi Kim Thuy said although her country has many female leaders, it did not occur to them to carry out such a study on their own women leaders. She made the remarks following an a hour-long discussion with UKM’s Director of the Centre for Women’s Leadership, Associate Prof Dr Madeline Berma and Deputy Director, Dr Bahiyah Dato’ Hj Abdul Hamidtoday. Mrs Thuy, who led a 10 member delegation of VWU on a two day whirlwind tour of Malaysia, had also met officials from the Ministry of Women, Family and Community Development and representativesof the National Council of Women’s Organisation (NCWO). The VWU represents all of Vietnam’s women movements and serves a role similar to the NCWO in Malaysia. Mrs Thuy said her country had many women leaders throughout its history in government and business but no research had been done on them. 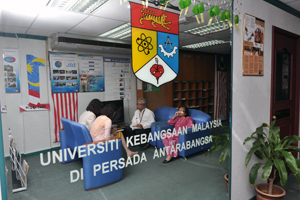 She said one of the women’s unions may take the cue from UKM’s Centre for Women’s Leadership and do something similar. Vietnam’s constitution, she said, does not discriminate between males and females and all of the posts and jobs there are open to women though there can sometimes be very subtle discrimination which is very difficult to prove. Mrs Thuy said VWU is always consulted by the government whenever a major decision is to be made or laws proposed in its parliament, the People’s Consultative Assembly. VWU is doing studies on gender, family and science and provides training for women in an academy that was set up recently in Ho Chih Minh City (Saigon). 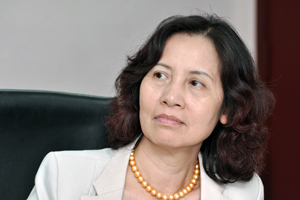 She said women are particularly well-represented in the media and publishing industries in Vietnam but are lagging behind in the top administrative posts and political decision-making. In Education, there is parity between males and females entering universities, but at the post-graduate and PhD levels the men outnumber the women slightly. As Vietnam becomes industrialised, she noted that more women are entering the manufacturing work-force. So, more vocational training for young women is needed. Asso Prof Bermaoffered to help the VWU organise short courses on leadership training which can be facilitated through the United Nations Development Programme (UNDP). The Centre for Women’s Leadership is researching female leadership and have identified 12 candidates in politics, business and community services. The research startedby Assoc Prof Bermaearlier this year is aimed at finding out the qualities that can make women become leaders in various fields. The VWU was established in 1930 during the French colonial era. Though Vietnam is about the same size of Malaysia, it has a population of 80 million against 28 million in Malaysia.